GIG NEWS: Yellow Sisters. London A Cappella Festival. 31 January. Free! YELLOW SISTERS will be performing at the LONDON A CAPPELLA FESTIVAL at Kings Place, Kings Cross, on Saturday 31 January. The renowned all-female Czech vocal group, whose repertoire is entirely self-composed, describe themselves as ‘sound illusionists’ whose music floats lightly between jazz, soul, funk, RnB, reggae and world music. Their lunchtime set starts at 12.25pm in the Kings Place foyer. Admission is free. The group formed in 2005 and have released five albums in total. Their tight-knit vocal harmonies are often accompanied by improvisations from onstage dancers. Yellow Sisters will also sing at the Triple Crown pub in Richmond on Sunday 1 February, where the first half of the performance starting at 6.30pm will be baby-friendly. Tickets are on sale from £9 here. Click here for video of the band and more information from the Czech Centre London. Further video can be seen here on Yellow Sisters’ official website. In Britain there’s BBC Radio 1 for all (well, some of) the latest music. And the Czech Republic has its very own ‘RADIO 1’, broadcasting 24/7 from Prague. CzechHarmonies introduces you to the biggest single Czech radio station dedicated to promoting cutting edge music with an independent spirit. There’s a Radio 1 in London…and there’s a Radio 1 in Prague. However, there are some important differences between the BBC’s flagship new music station and its Czech namesake. For starters, Radio 1 (or ‘Radio Jedna‘, as they say in the ČR), is exclusively and constantly geared to innovative, experimental and independently-minded music whereas BBC Radio 1 mainly plays ‘The Interesting Stuff’ at night, reserving the daytime predominantly for ‘The Commercial Stuff’ – including the disposable Simon Cowell-type nonsense. You could say Radio Jedna is more Huw Stephens and Benji B than Fearne Cotton and Scott Mills, in terms of pushing the creative envelope. And certainly Radio Jedna presenters would rather throw themselves off Charles Bridge into a watery grave than give so much as a second’s airplay to any X-Factor-style crap. If anything, the Czech Republic’s Radio 1 – an independent radio station and not part of Český Rozhlas, the main Czech broadcasting company – is perhaps closer in spirit to BBC 6 Music, though probably with less 1980s indie on its playlist, and with a wider and more colourful palette of genres. Although the bulk of the station’s output consists of new, recent, and not-so-recent indie, alternative and generally left-field tracks hosted by a variety of presenters each with their own show, there are also a number of specialist programmes covering fields like electronica, techno, breakbeat, hip-hop, jazz, swing and dancehall. And those looking to get their teeth into something really substantial can savour the hour-long feature CD Nonstop (Mondays to Fridays, 19:00 Czech time/18:00 UK time), in which a critically acclaimed album from recent times is played in its entirety from start to finish without interruption. Recent airings have included full albums by Vashti Bunyan, Interpol, Kasabian, Aphex Twin and the Ukelele Orchestra Of Great Britain, as well as from the Czech Republic’s own Jan Burian, The Prostitutes, Vypsaná fiXa and Jasná Páka. You won’t get CDs broadcast nonstop like this on BBC Radio 1…well, apart from very, very occasionally on Zane Lowe’s programme. ‘But what’s in the Czech Radio 1 charts?’ I hear you cry. Depends which charts you mean. There are two: the ‘Hitparáda Radia 1’, and the ‘Velká Sedma’. The Hitparáda Radia 1 is comprised mainly of successful mainstream alternative/indie/electronic acts, many of them familiar names from the UK and US (including, at time of writing, Lamb, TV On The Radio, Thom Yorke, Submotion Orchestra, the Drums, Cathedrals, Total Science and Royal Blood) – evidence that most of the Czech music-buying public, despite the flourishing of domestic acts since the end of the Communist era in 1989, still look mainly to the West for inspiration. 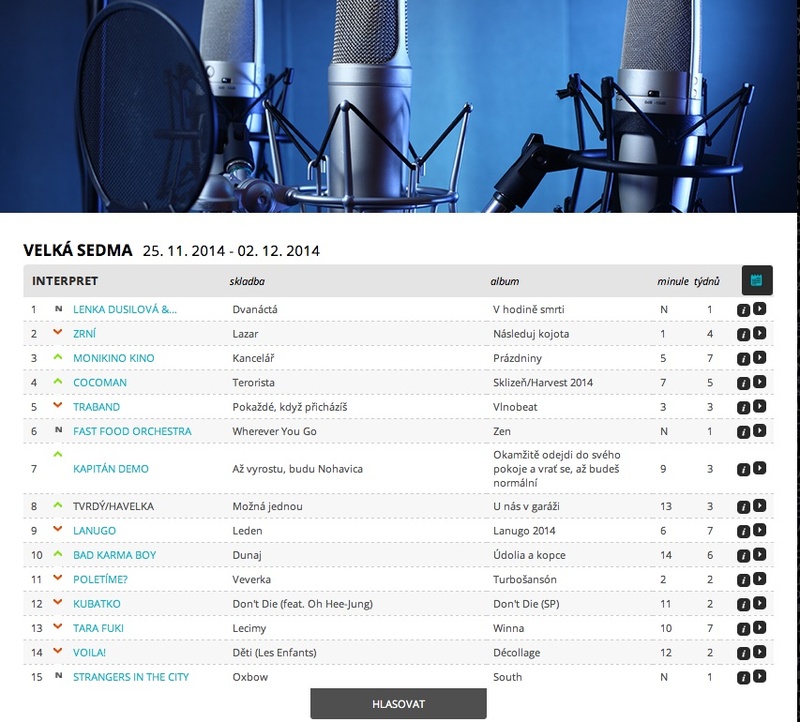 The Velká Sedma, meanwhile, is a kind of Indie Chart for homegrown Czech (and a few Slovakian) acts that mainly, as yet, don’t have a high enough profile to make the Hitparáda Radia 1, so it is very unusual to see the same names in both charts. ‘Velká Sedma’ translates as ‘The Big Seven’: there were seven songs when the chart started back in the early 90s, but they’ve kept the name despite gradually expanding the chart to 15 places. As I write, No 1 on the Velká Sedma chart is the second single from Lenka Dusilová & Baromantika’s new album ‘V Hodině Smrti’. Other Velká Sedma high flyers currently include Zrní, Monokino Kino, Lanugo, Bad Karma Boy, Kubatko and Tara Fuki. Genrewise, these and other names on the chart encompass everything from atmospheric acoustic dream-pop to indie guitar rock via ambient electronics, reggae-pop, lo-fi folk, punk-country and cello improvisations! Radio 1 listeners who register with the station’s website can vote (hlasovat) for their favourite tracks, thereby helping to shape the following week’s charts. Currently the Hitparáda Radia 1 is featured during two-hour timeslots on Thursday evenings and Sunday mornings, while the Velká Sedma chart also gets a couple of two-hour windows, on Tuesday evenings and Saturday mornings. If you’re feeling daunted by the plethora of music emanating from the Czech Republic, or by your inabilty to understand the Czech language, Radio 1 is one good place to start exploring. On both the Hitparáda Radia 1 and the Velká Sedma web pages, clicking on the artists’ names will take you either to the artists’ official websites or to their Facebook/ Twitter/ YouTube/ Soundcloud/ Bandzone etc pages for more information. 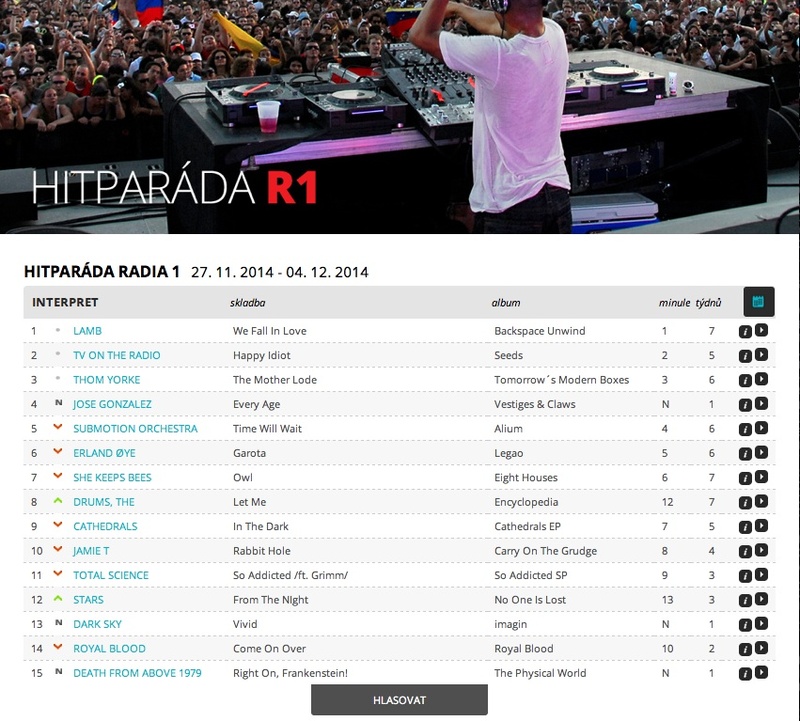 The current Hitparáda Radia 1 can be viewed here. The current Velká Sedma chart can be viewed here. It is not Albert Černý’s first time in Britain, not by a long stretch. But then, if you were Upstairs@Highbury Garage on the evening of Thursday 13 November, you will almost certainly have detected this from the impeccable English accent of the Lake Malawi singer/ guitarist/ frontman/ songwriter-in-chief, as he won over a transfixed audience. Indeed, if you didn’t know otherwise, you would have no idea that Albert Černý is not from these shores at all, but from a small village near Třinec, a steel town in the demographically nebulous region of Moravia/Silesia, near where the Czech, Slovak and Polish borders intersect, and from where his first band, Charlie Straight, emerged so triumphantly in the late 2000s to win three Anděl Awards (the Czech equivalent of the Brits or Grammies) and mark out a sizeable territorial claim on the Czech Republic’s musical landscape for half a decade. Keeping quiet about his roots? The strange thing is this. During Lake Malawi’s ecstatic nine-song set as support act to Nottingham grunge outfit Kagoule, Černý (pronounced ‘Chairny’) proudly informs the audience that “this is our first ever gig in London!”. In fact, he tells us this four times throughout the set, just to make sure it’s sunk in. Which naturally prompts the question: so where are you from? But at no point does he inform us of the band’s country of origin. This worries me. I’m here to champion the great music currently emerging from the Czech Republic…and I’m thinking, is this guy deliberately keeping quiet about his roots? If so, why? And will I have to keep quiet too? And how do I do that…writing a blog called CzechHarmonies??? “It’s not that we’re keeping quiet about where we’re from,” explains Černý post-gig, “it’s just that we don’t particularly want to mouth off about it. But if people ask us, of course we’ll tell them. We’re not trying to hide it. They’re certainly well on the way to being successful in their homeland. 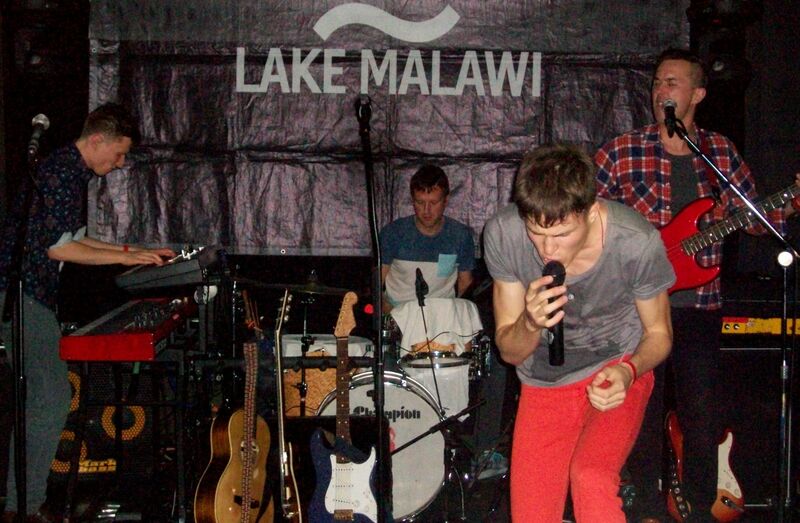 Although they have only one single under their belt (‘Always June’), Lake Malawi have been making some bigwigs sit up and take notice, and this summer secured a prestigious support slot with Thirty Seconds To Mars at Prague’s Tipsport Arena, followed in September by a breathtaking 12-song set at Czech Radio’s Studio 1 in Ostrava, streamed live over the internet. You can see this on YouTube (though the video seems to skip a bit in places). If your weakness is for swirling, perfectly crafted, head-in-the-clouds pop songs that inspire you to hitch a lift with the seagulls across the oceans to find your one true love, it is impossible not to fall for the four-piece band, which also includes Černý’s erstwhile Charlie Straight bandmate Pavel Pilch on drums, as well as Jeroným Šubrt (from Brno-based band Admiral Ackbar) on guitar/bass/keys and Patrick Karpentski (commandeered from Lenka Dusilová’s band Baromantika) on bass/guitar . And while Černý sings in a uniquely hybrid English regional accent that seems to lie in some parallel universe with direct connections to Camden Market, the music has a quintessentially east-European emotional intensity that envelopes you in its measured rush, whilst also clearly rooted in the 1990s British pop tradition. So, Albert, where did you learn to speak English so well, and what British music were you listening to at the time? And while while Britpop might also have been an inspiration back in his Charlie Straight days, Černý has certainly moved on from such influences: “I was only at primary school when Blur, Pulp and Oasis were at their height.” Bon Iver would be a more recent reference point, influence-wise: indeed, the name of the band comes from the line ‘So it’s storming on the lake’ in the song ‘Calgary’. All these formative influences ultimately manifest themselves in the structural solidity of Černý’s compositions, if not in their overt sound and style. ‘Day For Finding Someone’, which formed the central nucleus of Lake Malawi’s Highbury Garage set, is a wonderfully accomplished pop dream, but what makes it soar is the astute use of insistent, unwavering atmospheric synth chords to accentuate throbbing bass and plaintive vocals. And there is no let up in the creative ammunition anywhere else in the set. ‘Young Blood’ cranks up the tempo and the passion for a pulsating declaration of devotion (You could be my Juliet / Young blood in your veins / Age doesn’t matter anyway / Be my shelter from the rain), with strummed acoustic guitar bolstered by pummelling percussion and peppered with wisps of atmospheric electric guitar and a sustained single note on the synth. On several songs, lyrically speaking, Černý seems to have a thing about birds and oceans as symbols of freedom and emotional mobility, and ‘I Swam The Sea’ is a case in point (I swam the sea / Swam the ocean / I set you free / Like a bird). With its infectiously danceable rhythm and poignantly jangling guitar riff, it’s a potential future hit single, but Lake Malawi are frankly spoilt for potential future hit singles. And vying for chartbusting status are ‘Chinese Trees’, which will definitely be the band’s second single at the beginning of December, along with – surely worthy of re-release when the band has gathered some unstoppable momentum – the aforementioned ‘Always June’, sporting that all-important sing-a-long chorus hook with which Černý gets the punters securely wrapped around his little finger. And further evidence of his undeniable stagecraft is the ease with which he persuades the Garage audience to shuffle forward halfway through the set to eliminate that awkward empty gap in front of the stage, not to mention a perfectly timed gymnastic leap from atop the electronic organ situated in front of Pavel’s drum kit. He also embarks on an enthusiastic foray down into the audience as far as the length of his jack lead will permit him. Albert Černý may be no School of Rock soloing virtuoso on his purple-and-white Stratocaster, but his canny instinct for what you can and can’t pour into the perfect indie-pop song mould, as well as the heart-on-sleeve sincerity with which he tunefully yearns for that elusive personal utopia, is something you can’t teach. And if you missed Lake Malawi’s Highbury gig, rest assured you’ll get your chance to experience their rarefied brand of euphoria next year, when their debut EP is released. Meantime visit their website http://www.lakemalawimusic.com/ for further announcements. 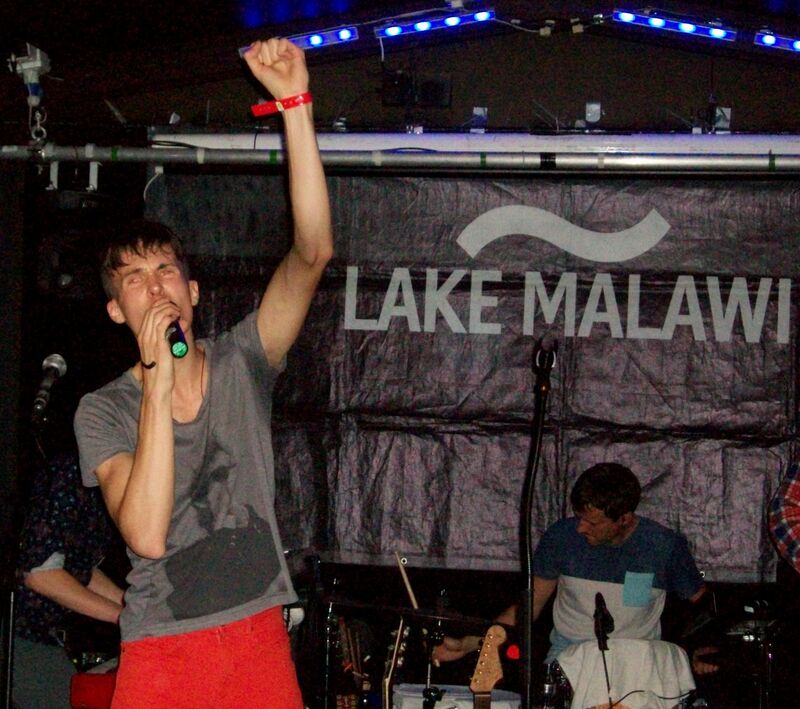 Lake Malawi’s new single ‘Chinese Trees’ is due out on 1st December 2014. They are currently working on their debut EP due out in 2015. 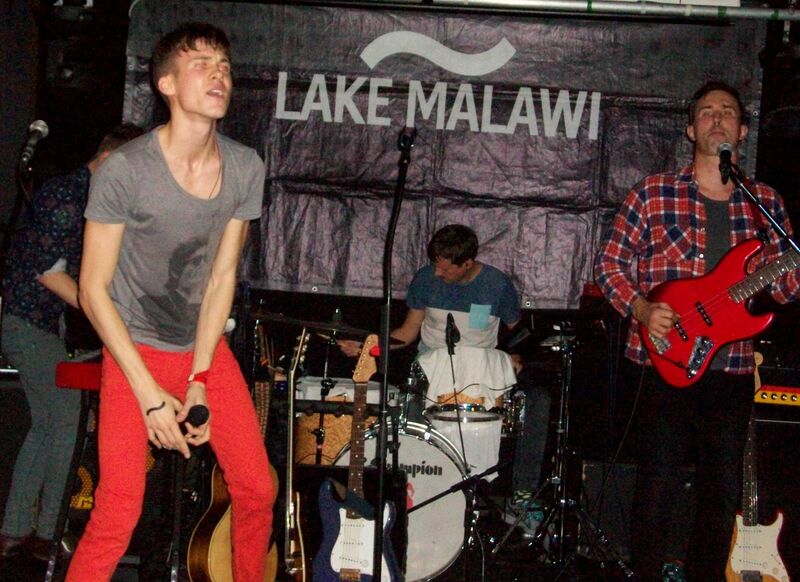 You can visit Lake Malawi’s official website here. The band’s 55-minute live set at Czech Radio’s Ostrava Studio 1 can be viewed here. DG307, one of the most significant acts in Czech counterculture history, are performing this Saturday evening at St Giles Church, Camberwell, London, as part of JazzLive at the Crypt. Co-founded in 1973 by Plastic People Of The Universe stalwart Mejla Hlavsa and dissident poet Pavel Zajíček, the six-piece outfit are renowned for an uncompromising repertoire that encompasses tight alternative-rock song structures, jazz-influenced improvisation and dissonant, expansive soundscapes as backdrops for Zajíček’s intense, evocative vocal declamations. The London performance will feature the band’s late 1970´s classics alongside more recent work and will also include excerpts from their setting of T.S. Eliot’s poem The Waste Land, originally composed and recorded in Camberwell. Zajíček will be returning to his old stomping ground in south London where he spent much of the 1980s after a period of imprisonment by the authorities in communist Czechoslovakia. While Zajíček himself became an active participant in Camberwell’s local music scene during this period before returning to his homeland in 1989 to resurrect the band, this will be DG307′s first ever gig in London – as part of the Made In Prague 2014 festival. Aidan Andrew Dun and Lucie Rejchrtová will be making special guest appearances with the band. To experience DG307′s arresting performance style, and in particular Pavel Zajíček’s unique onstage presence, you can check out an online video of the band’s 35-minute tour de force “Životy? Nebo bludné kruhy?” (“Lives? Or vicious circles?”) on their Bandzone page here. The Czech Centre London is a coorganiser of this event and tickets can be bought here.